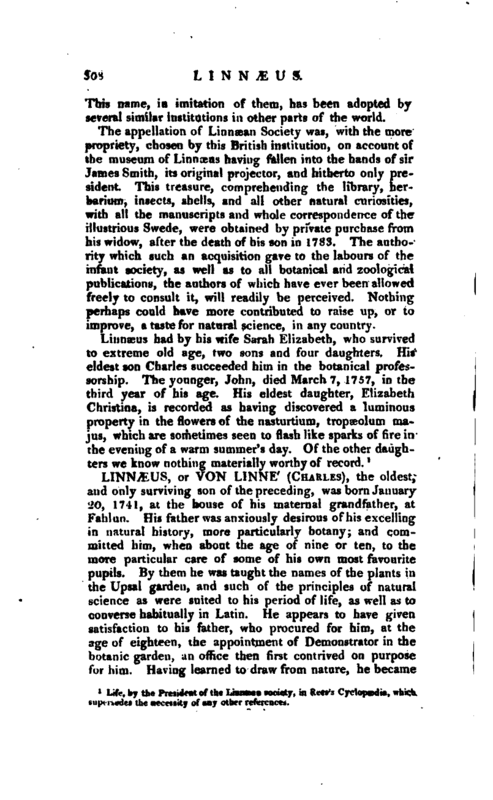 , or Von Linne' (Charles), the oldest, and only surviving son of the preceding, was born January 20, 1741, at the House of his maternal grandfather, at Fahlun. His father was anxiously desirous of his excelling in natural history, more particularly botany; and committed him, when about the age of nine or ten, t the more particular care of some of his own most favourite pupils. By them he was taught the names of the plants in the Upsal garden, and such of the principles of natural science as were suited to his period of life, as well as to converse habitually in Latin. 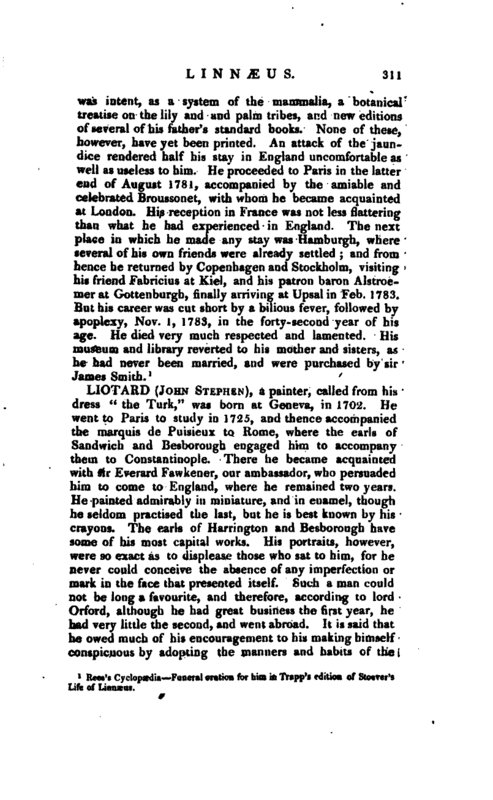 He appears to have given satisfaction to his father, who procured for him, at the age of eighteen, the appointment of Demonstrator in the botanic garden, an office then first contrived on purpose for him. Having learned to draw from nature, he became | an author at the age of twenty-one, publishing in 1762 his first “Decas Plantarum Rariorum Horti Upsaliensis,” the plates of which, in outline only, were drawn by his own hand, and are sufficiently faithful and useful, if not ornamental, while the descriptions are full and scientific. In 1763 another “Decas,” or collection of ten species, came out on the same plan, but, for whatever reason, he printed no more numbers under this title. In 1767, however, he published at Leipsic ten more plates and descriptions, like the above, entitled “Plantarum Rariorum Horti Upsaliensis Fasciculus Primus,” but no second fasciculus appeared. In 1763 he was nominated adjunct professor of botany, with a promise, hitherto unexampled, that after his father’s death he should succeed to all his academical functions. In 1765 he took his degree of doctor of physic, and began to give lectures. His progress would probably have been happy, if not brilliant, but for the conduct of his unnatural mother, who, not content with dishonouring her husband’s bed, and making his home as uncomfortable as she could, by the meanest parsimony and disgusting petty tyranny, conceived a hatred for her only son, which she displayed by every affront and persecution that her situation gave her the means of inflicting on his susceptible and naturally amiable mind. 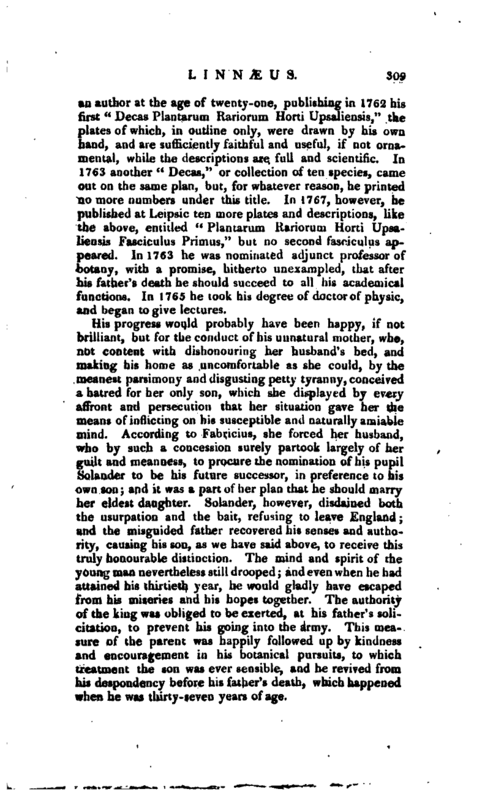 According to Fabricius, she forced her husband, who by such a concession surely partook largely of her guilt and meanness, to procure the nomination of his pupil Solander to be his future successor, in preference to his own son; and it was a part of her plan that he should marry her eldest daughter. Solander, however, disdained both the usurpation and the bait, refusing to leave England; and the misguided father recovered his senses and authority, causing his son, as we have said above, to receive this truly honourable distinction. The mind and spirit of the young man nevertheless still drooped; and even when he had attained his thirtieth year, he would gladly have escaped from his miseries and his hopes together. The authority of the king was obliged to be exerted, at his father’s solicitation, to prevent his going into the army. This measure of the parent was happily followed up by kindness and encouragement in his botanical pursuits, to which treatment the son was ever sensible, and he revived from his despondency before his father’s death, which happened when he was thirty-seven years of age. | Though obliged by his mother to purchase, at her own price, the library, manuscripts, herbarium, &c. which he ought by every title to have inherited, he rose above every impediment, and betook himself to the useful application of the means now in his hands, for his own reputation and advancement. His father had already prepared great part of a third botanical appendix, or “Mantissa;” from the communications of Mutis, Kcenig, Sparmann, Forster, Pallas, and others. Hence originated the “Supplementum Plantarum,” printed at Brunswick, under the care of Ehrhart in 1781. 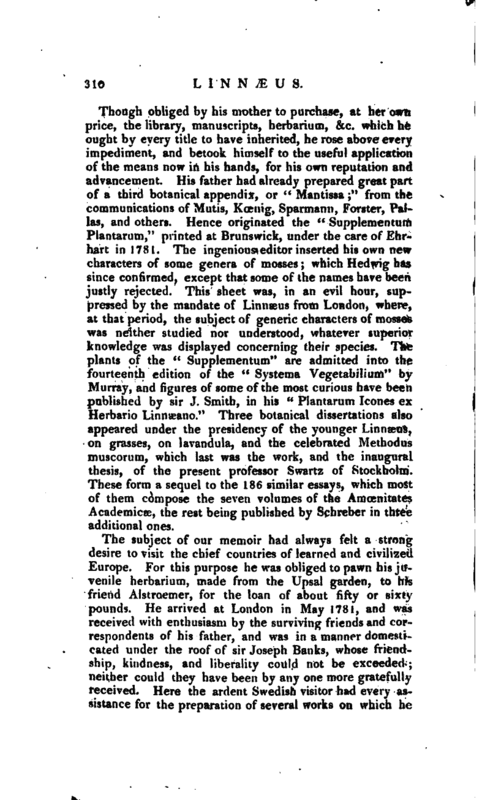 The ingenious editor inserted his own new characters of some genera of mosses; which Hedwig has since confirmed, except that some of the names have been justly rejected. This sheet was, in an evil hour, suppressed by the mandate of Linnæus from London, where, at that period, the subject of generic characters of mosses was neither studied nor understood, whatever superior knowledge was displayed concerning their species. The plants of the “Supplementum” are admitted into the fourteenth edition of the “Systema Vegetabilium” by Murray, and figures of some of the most curious have been published by sir J. Smith, in his “Plantarum Icones ex Herbario Linnæano.” Three botanical dissertations also appeared under the presidency of the younger Linnæus, on grasses, on lavandula, and the celebrated Methodus muscorum, which last was the work, and the inaugural thesis, of the present professor Swartz of Stockholm. These form a sequel to the 186 similar essays, which most of them compose the seven volumes of the Amcenitates Academicae, the rest being published by Schreber in three additional ones. Rees’s Cyclopædia—Funeral oration for him in Trapp’s edition of Stoever’s Life of Linnæus.